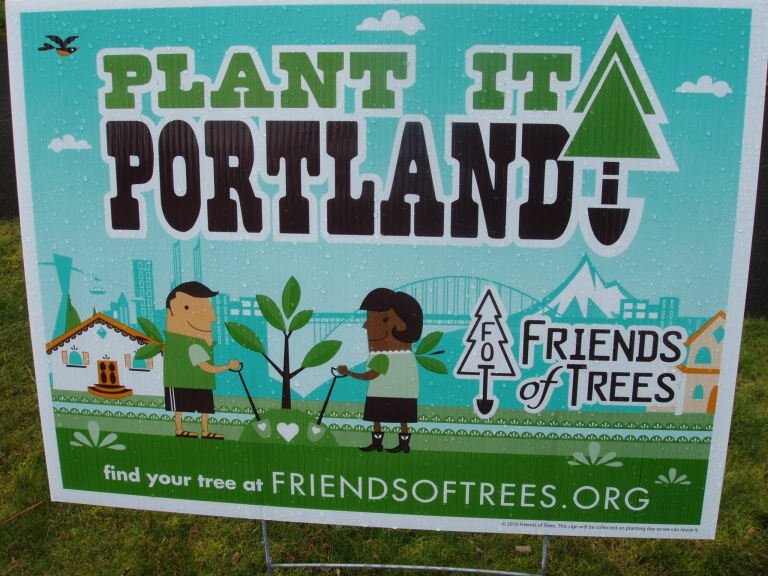 There is a local organization called Friends of Trees that strives to fill the cities of Portland and Vancouver with more trees. 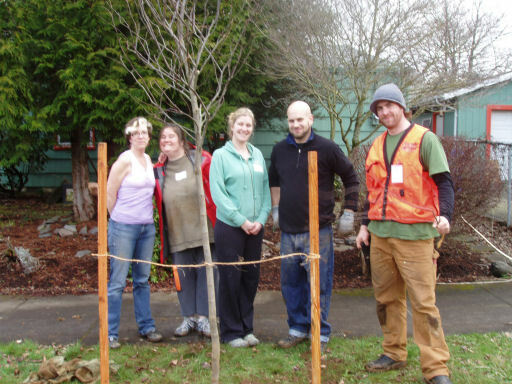 It’s a volunteer organization that helps property owners place trees and care for trees in our green spaces. I lived through the infamous Ice Storm of January ’98 in northern New England. Neighborhood trees were a primary reason for destruction and widespread power outages that winter. Ice caked inches-thick onto branches in densely tree-lined streets of Burlington, Vermont until the weight brought them down onto thousands of power lines. Transformer boxes exploded throughout the night. The city had power restored in a few days, but outlying rural communities of Vermont, northern New York, and the Canada border were without power for over a month. Two months later, on a work trip through the Northeast Kingdom in March, I saw that the ice still had not melted in some places. There was a public outcry that gained support that winter, to chainsaw every last city tree to the ground to prevent that catastrophe from happening again. Despite having seen the worst case scenario, I remain convinced that it’s better to have trees on city streets. 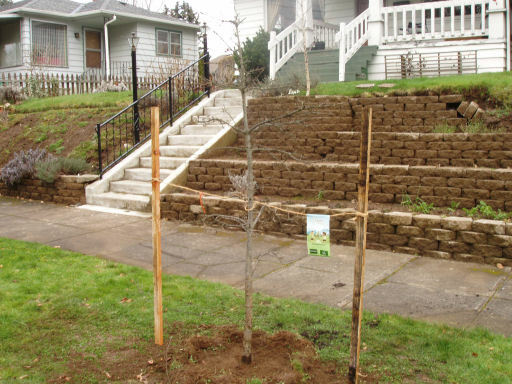 Last summer I had already spotted some of the recently planted trees from Friends of Trees in my neighborhood. You can tell because of the high quality planting, the large trees, and the tags placed on the stakes that they are from FofT. 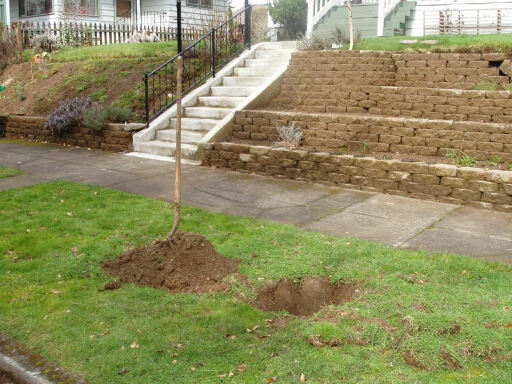 I had considered looking into the program last Fall when a volunteer showed up on my porch one day and said she noticed there was space on my property that could use a tree. 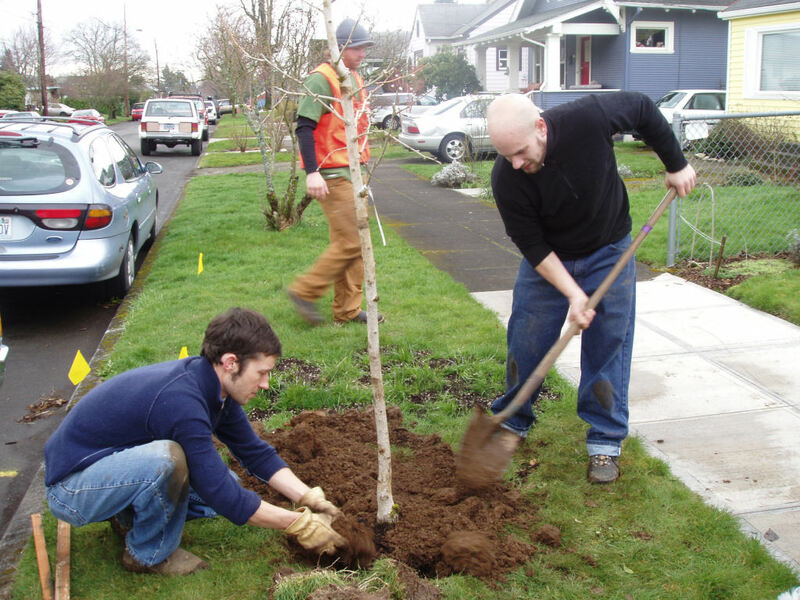 When I said I agreed that there should be a tree in that piece of lawn between the street and the sidewalk, she asked if I was interested in working with Friends of Trees. Yes. Yes I was. The available trees are listed on a website at hugely discounted prices. In exchange for the awesome deal, buyers are encouraged to volunteer some time to the group on a planting day. I bought my seven-foot Oregon White Oak for only $35, and of course that includes the planting. Oaks are slow-growers, which explains why it was only seven feet high. Many of the trees go in as tall as fourteen feet. Where else can you get such a great bargain? One board member was proud to tell us that just last week, Friends of Trees planted their 400,000th tree! Awesome! Our crew joined up at Tristan’s truck full of trees, then we headed off to the first address to begin. The first planting turned out to be a major challenge. The spot that had been marked out for us turned out to be the site of a buried stump! Doggedly determined, the guys hacked and pounded and scraped and clawed and dug and pushed (and maybe cursed just a teensy bit), till we finally had a hole large enough to accommodate a substantial rootball. Our crew leader Nick was very knowledgeable and experienced, which turned out to be a great asset during the day, and particularly with that first tree. 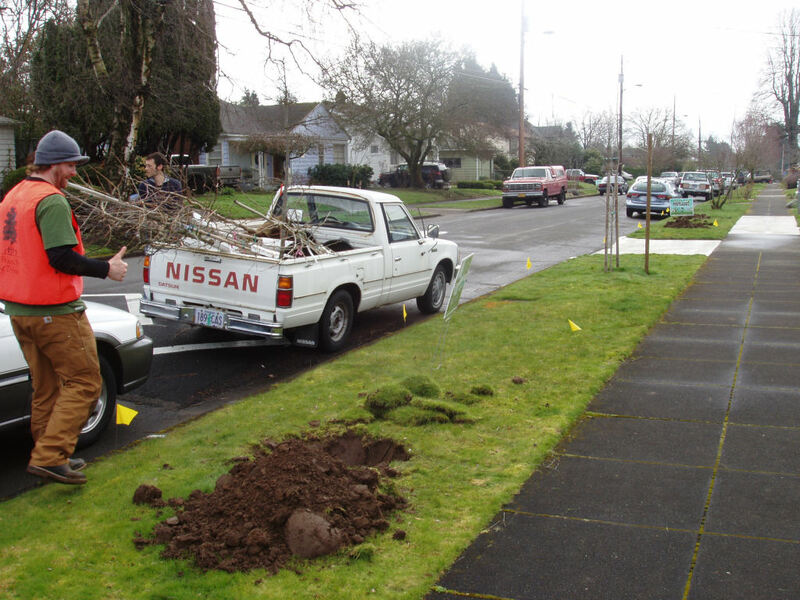 Next we planted three ginkgos for neighbors who coordinated their choices to match the ginkgo already there. Chuck, one of the homeowners, came out with hand baked energy bars from Trader Joe’s that were delicious even though I had just eaten at the church. Four ginkgos in a row will be lovely this summer, and I’ll have to drive by and see them. 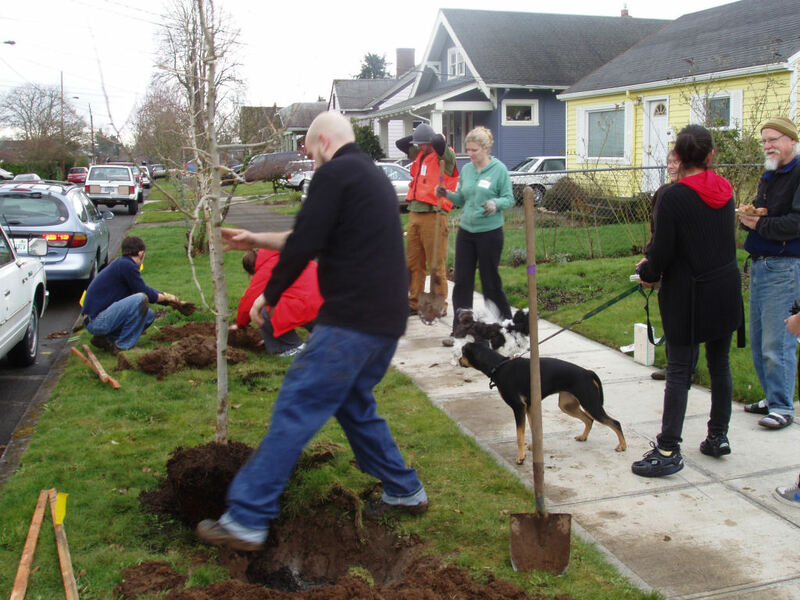 As we planted, other neighbors walking their dogs showed up, and it was fun to see what a community event Friends of Trees had created, because of course they knew Tristan and Chuck, and were all talking together. Tristan’s Red Bud was next, where we got to meet his lovely wife, at home with their new baby. Then we crossed Stark to busy Washington, where Meghan and Nick’s spiky Hawthornes will provide beauty, shelter, and hopefully a buffer to the traffic, not to mention a built-in defense system. My old house was next. It was a potentially uncomfortable situation, bringing a gang of new friends to the house I no longer live in. I gave a brief explanation that he and I aren’t dating anymore, I don’t live there, but I purchased the tree and committed to my volunteering when I did live there. I tried to lighten it up a little by saying, “Maybe we’ll get lucky and meet his mother!” Dawn picked up my meaning immediately, knowing that my sarcasm meant I hoped not to see her at all. Well, true to form, Mark’s mother (who still lives there) was on site perfectly on cue. She stood by and critiqued the work, making sure to tell Nick, the arborist, how to do his job. We were all rather pleasant about it, and in no time, my beautiful Oregon White Oak was placed in front of the famed house on Morrison Street. Believe me, I will pass by frequently, and thrill as it grows. Tell me, tell me, how could there be a better way to spend volunteer time? Our last two trees were for Jesse, whom we lost from the crew in the church parking lot because he needed to find someone with space to bring him along. 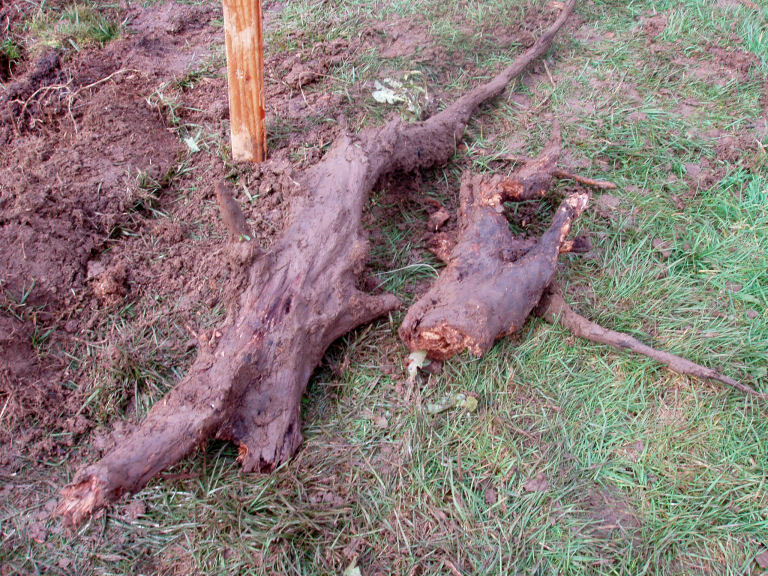 One of the trees was a tulip tree and a challenging planting because it was bare root instead of a root ball. We relied heavily on Nick’s guidance and pulled off a beautiful placement. At Meghan’s house, Nick found out that my daughter Tara wants to be an arborist. She has been certain of that for nearly two years now. Nick was jealous and excited to hear it, wishing that he had known so early in his education what he wanted to do. I told Nick about Treeverse, a documentary in the making about two Oregonians who will travel a full kilometer from treetop to treetop without touching the ground and bringing their gear with them. He gave me some brilliant advice on how to keep Miss T interested in trees, how she can gain valuable knowledge and experience, and even some college programs to recommend to her. Though Friends of Trees pulled together a splendid hot lunch from donations from Papa Murphy’s as well as many dishes of home cooked food from volunteers, I was ready to head home and check on my girl. She arrived at the same time, home from her own volunteer morning at her school basketball concession stand. She says, “Wow, Mom, you’re in a really good mood.” Yeah, sometimes I need to exit the cocoon and interact with people. 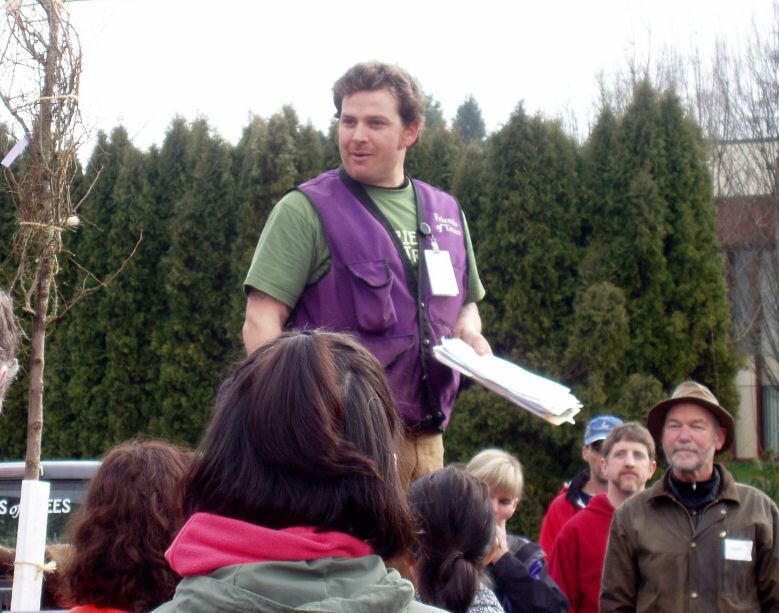 I think I’ll talk my budding teen arborist into volunteering with Friends of Trees a few more times this Spring. It will be good for both of us. Thanks Tink! I agree with you: everyone who makes it happen, from organizers to sponsors to homeowners should get kudos. And hats off to the city for allowing the group to fuss so close to streets. yes, it’s good to see things like this happening. You’re right, Suzi. I’m glad I live in a community that takes the trouble to keep this great program running.